After launching a new iMedEd initiative built around Apple's iPad, the University of California at Irvine reports that students in the program have now scored "an average of 23 percent higher on their national exams" than previous classes, "despite having similar incoming GPAs and MCAT scores." A report on the innovative program (noted by Jim Dalrymple of the Loop), which launched in 2010, says the "iPad-based curriculum mirrors new age of patient care." Apple has drawn particular attention the iMedEd Initiative, designating it as an "Apple Distinguished Program" for being an "innovative, digital-based educational platform that conforms to the 21st century learning styles and needs of students throughout the world," wrote UC Irvine School of Medicine dean Dr. Ralph V. Clayman. 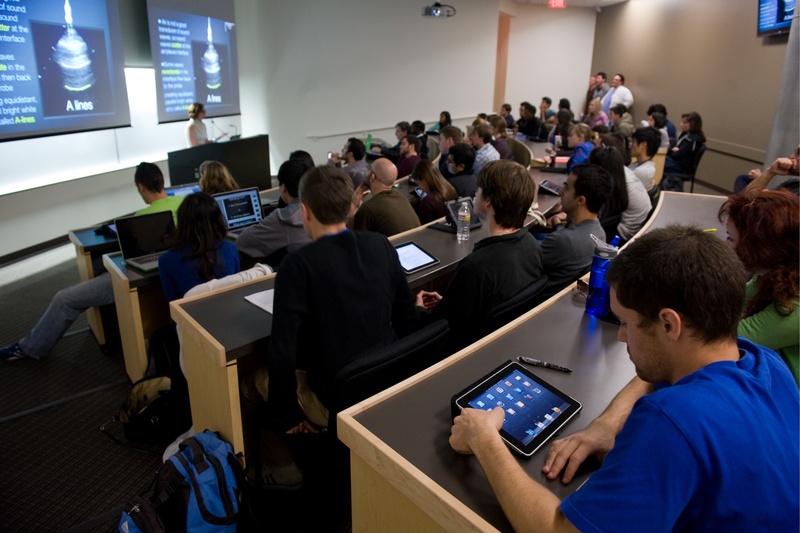 Under the program, incoming UC Irvine medial students receive iPads that provide digital copies of all textbooks, along with access to podcasts of all lectures and other instructional materials. The iPads also provide secure access to patient records and recorded data from "digital stethoscopes, bedside diagnostic ultrasound units and a variety of other medical devices." A group of medical students participating in the iMedEd program have formed an "innovators group" to discus the latest technologies that could factor into the medical school's curriculum, and have partnered with the Donald Bren School of Information & Computer Sciences to hold a "Med AppJam" devoted to building new iPad apps for healthcare. In just ten days, more than 100 participants had developed 19 specialized iPad apps for healthcare, including "one focused on acute care during natural disasters and another that provides instruction for bedside diagnostic ultrasonography." An international program has also formed to investigate how the iPad can be paired with a portable point-of-care ultrasound unit in order "to improve healthcare and medical education in Peru, Australia, China, Vietnam, Nicaragua, India and Israel."